Need to stretch your legs and see the bush from a whole new perspective? On a guided bush walk you will discover a sense of wonder and see many things you've never noticed before. 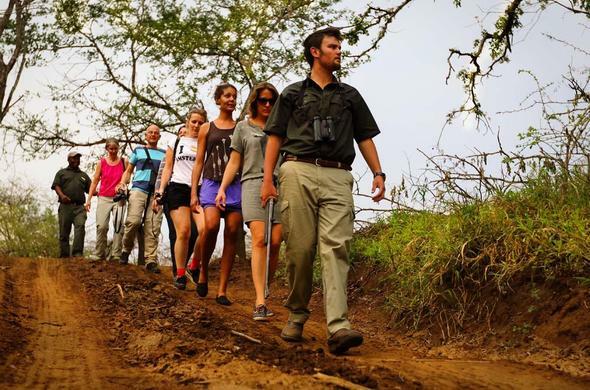 Experience the wild with a difference on this slow paced adventure in KwaZulu-Natal! Your safari will take on a new dimension as soon as you set off with your ranger into the wilderness. So many details and wonderful intricacies within nature are overlooked on game drives. You will learn a great deal and before you know it you will be able to identify animal tracks and bird calls.With your feet on the ground you can follow animal trails and feel what it is like to move quietly through the bush. Bush walks are sensory experiences and you will find that somehow your awareness has been heightened. Every sound and scent is magnified and you can get closer to nature than ever before. KwaZulu-Natal bush walks are usually conducted at the cooler times of the day especially in the morning, so you may have to rise early. After a snack and drink, your ranger will give a short safety briefing and talk about dos and don'ts in the bush and how to behave if you encounter wildlife on the walk. Bush walks are usually between 1 and 3 hours long.On the walk you follow in a line behind the ranger (sometimes there is a tracker who joins in). Along the way your ranger will stop to indicate various points of interest and to share his / her knowledge. This is a fascinating opportunity to understand how many aspects of nature fit together to create the cycle of life.You could investigate the gossamer wings of a dragonfly or the complexities of a spider web. Your ranger will also explain about the healing properties of certain plants and show you different animal tracks in the sand. Any birds and animals will be identified and you will find out interesting facts about how they live and their natural habitats. On a KwaZulu-Natal safari you have an amazing array of choices when it comes to lodge location - you could stay in the heart of the bush, go for a bush and beach combination, head for higher ground or enjoy a visit to the Zulu Kingdom. The flora and fauna you encounter will depend on which area you are walking in such as in a river valley, rare sand forest or mountain bushveld. In any case, you will be able to burn off the effects of wonderful safari cuisine and savour your surroundings!